A Hallwalls Artist In Residence project, made possible in part by a major grant from the National Endowment for the Arts. For the past twenty years, objects and sound have played an ongoing and intimate part in the practice of Toronto artist Marla Hlady. Often, a rigorous and seemingly solid sculptural form has been injected with an element of seemingly spontaneous action—which generates its own sound score—as well as pre-recorded sound elements introduced innocuously into fabricated objects. There has often been a duality between the desire to contain and shape sound and motion and the impulse to let it find its own self-actualizing space. 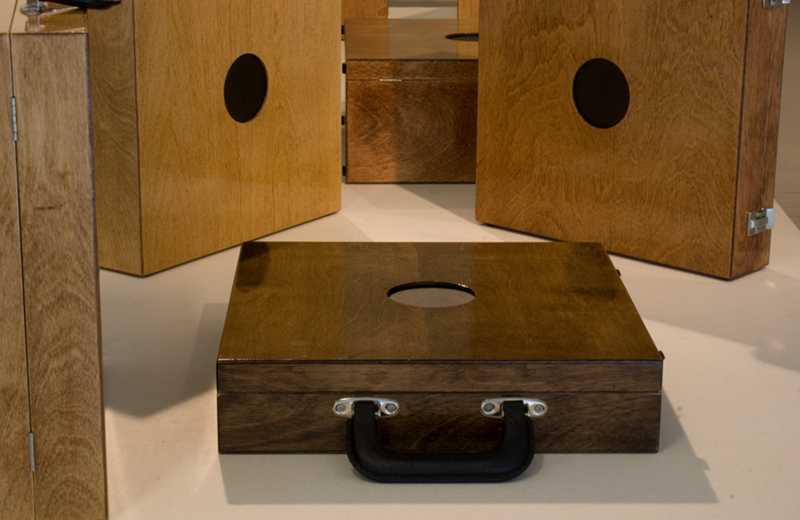 Begun in 2009 and ongoing, A Case For Sound is a sound object made to look somewhere between a suitcase/carrying case, record album box, instrument and portable record player. 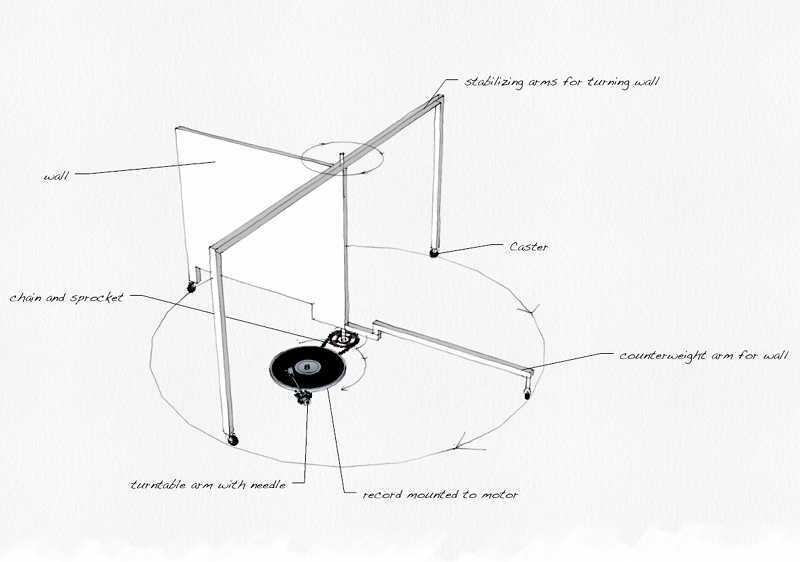 The object is constructed with wood and finished to a high gloss, holes are cut in each side for the speakers. Inside an MP3 player loops an audio segment. A motion switch interrupts the audio when the object is tilted. If repeatedly tilted, the interrupted audio can sound similar to a skipping record. Hlady remains interested in how the temporal strategies of her work and their various sound components relate to a variety of musical practices. Think John Cage, Alvin Lucier, Terry Riley and, in the case of the new work created for Hallwalls, Alexander Calder's Circus. Within intentional parameters—often defined by the creation of extremely specific objects and movements—Hlady has often left her work sufficient free reign to "play itself out." And "play" is an integral element in her previous and present work. Walls, which will also be on view in the gallery, involves the viewer's interaction with the work in order to play or perform the piece. In a new, site-specific work, Hlady introduces a sculpture based on Hallwalls' trio of movable walls which exists within the larger gallery (upon which it is based) as its own autonomous entity. The moving walls, reduced to 1:5 scale are transformed into musical instruments performing on their own and, in an acute manner, pointing to questions Hlady has always been illustrating about control and abandon—how much of an artist's control is actual and how much illusory? This has always been an intriguing question in Hlady's work in particular because she has often created objects and sculptures that are highly refined, sometimes industrial in nature, and that evoke a sense of certainty about their purpose. And yet, Hlady has also often introduced the wild card, a gesture or mechanism that loosens the reigns, even in a tightly-calibrated work. There is a simultaneous impulse in Hlady's work to control and predetermine innumerable elements while enabling the work to often create its own spontaneous, organic reality. Along with these sculptural works, graphic scores and other drawings of sound will complete the exhibition. HARP is made possible by a major grant from the National Endowment for the Arts (NEA). The artist gratefully acknowledges the additional support of the Canada Council for the Arts, The Ontario Arts Council, and the Toronto Arts Council.